· The Prime Minister stated the point of a recent special day in Derby was to ask one ''fundamental question - what can government do to help the economy to rebalance ... to invest and employ people". · On the same day the Chancellor of the Exchequer said "Derby is a great example of what Britain's economy should be in the future and a strong endorsement of the importance of manufacturing industry". Government statements and action are in direct contradiction. The Government must be made to reverse the decision and award the contract to Bombardier even if this offends some EU rules of the EU Single Market. Other Member States protect their industries, why not Britain? The Secretary of State for Transport has the flexibility to do so. It is time to put an end to the near complete demise of manu­facturing in Britain - this industry is required to help get Britain out of the “financial quagmire” and the Government should put its money where its mouth is. A DERBY Telegraph investigation has revealed the Government DOES have grounds to scrap its decision to hand Siemens a £1.4bn rail contract because the German firm was involved in worldwide corruption. A European Union rule, uncovered by the Telegraph, states that ministers could have barred Siemens from the Thameslink competition during the tendering process because of the scandal. Legal experts now claim the Department of Transport could still use concerns about corruption as grounds to abort the deal. Kevin Bampton, Head of Law at Derby University, said: "If they don't think that enough has been done to resolve the corruption issue, it is not just that they could change the decision now – they SHOULD change the decision now." 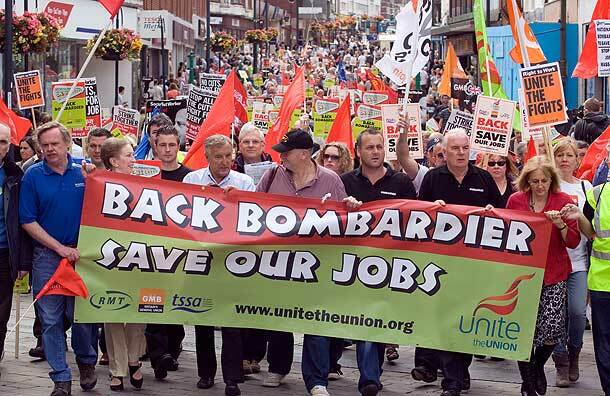 The news brings fresh hope that the contract could be given to Bombardier, safeguarding hundreds of jobs at the firm's Litchurch Lane site. While Siemens was bidding for Thameslink, it was fined a record $800 million in the USA and 395 million euros in Germany over bribery charges, in addition to another 201 million euros it paid out in 2007. It was barred for two years from bidding for contracts from the World Bank. Only last month a further potential bribery case was discovered at Siemens' business unit in Kuwait. Department for Transport officials claimed laws allowing them to exclude bidders from contract competitions only applied to individuals, not whole companies like Siemens. No individuals involved in corruption had been part of the Thameslink bid, they said.